Travelling has become a big part of our life. According to the World Travel & Tourism Council (WTTC), global tourism generated $7,613.4 billion for the global GDP in 2016, and the total Travel & Tourism investment in 2016 was US$806.5 billion. The world is expected to attract 1,290,780,000 international tourist arrivals in 2017. Travel technology has transformed the way we travel, from buying your flight ticket, planning your trip to getting a unique travel experience. As a travel-lover, it is my great pleasure to introduce the following Hong Kong-based TravelTech startups that raised funding from investors, let alone save me lots of headaches when I plan a trip. If you are a travel-lover in Hong Kong, you probably have heard of Klook, an in-destination services booking platform that allows travellers to reserve attractions, activities, food, transport, and WiFi with ease. Klook announced on October 25, 2017, that it has raised close to US$60 million Series C funding. The Series C round was led by Sequoia China, with participation from new investor Goldman Sachs and existing investor Matrix Partners. Klook said various Asia-based family funds also took part in the latest round. With the new capital, the TravelTech startup plans to expand globally to North America, Europe, Australia and inbound visitors to Asia from these developed markets. On the other hand, Klook plans to use the capital to power its travel technology development. “We are extremely excited at the potential of AI technology in reshaping a traveller’s experience when researching and booking a trip…By leveraging our large amount of data sets and millions of transactions, we look forward to enabling visual and vocal search to satisfy travellers’ spontaneity with more precise and curated options,” says Eric Gnock Fah, Co-founder and President of Klook. Klook has gathered US$96.5 million to date from reputable investors in 4 rounds. “Klook’s mission is to empower every person to travel independently, with all in-destination needs taken care of, for the ultimate hassle-free experience and more time to enjoy the trip,” says Ethan Lin, Co-Founder of Klook. Founded in 2014 by Eric Gnock Fah and Ethan Lin, the startup is a team of 400 with 13 offices across Asia. 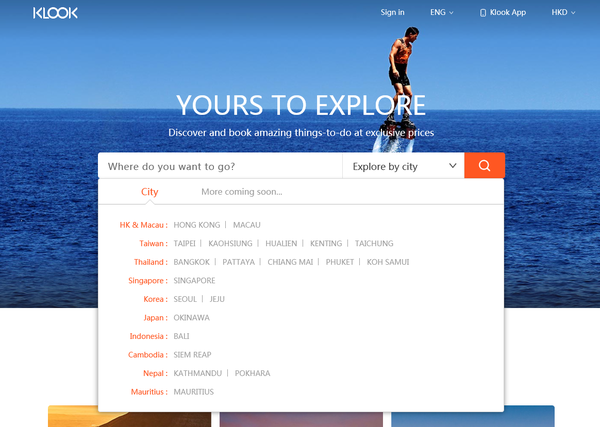 Klook offers close to 30,000 attractions, tours and activities in over 120 destinations worldwide. The TravelTech startup claims that it has over 1 million monthly bookings. Klook’s service is available in 7 different languages and accepts over 30 currencies. Klook’s direct competitor in the field includes KKday, a Taiwan-based travel e-commerce platform for travel experiences. KKday has raised US$11.5 million in Series A from AppWorks Ventures, 91Capital, Monk’s Hill Ventures, Mindworks Ventures, Cathay Venture and Substance Capital (HK). Founded by Ming Chen in 2014, KKday offers over 6000 travel experience to over 12 million travellers in 270 cities across 53 countries. If you have been travelling around, you might have found a smartphone in your hotel room that you can use for free during your stays, that “handy” smartphone is Tink Labs’ flagship product. Tink Labs develops mobile solutions for travellers, its product handy is an integrated device that provides internet access, unlimited local and international calls, hotel in-room service, city guide and more in one system. The phone will be placed in its partnered hotels, guests can explore the city carrying the phone around. The startup has raised US$125 million in a Series C funding round in September 2016 from investors including FIH Mobile, Sinovation Ventures and Cai Wensheng. The latest funding round brought Tink Labs’ total amount of equity funding to US$160 million, making Tink Labs one of the three “almost-unicorn” startups. It is reported that Tink Labs is raising about US$40 million and aiming for a valuation of more than US$1 billion in April 2017. Founded in 2012 by Terence Kwok, the handy smartphone is available to guests in about 100,000 rooms at three-star to five-star hotels in 20 major cities around the world, serving over 12 million global travellers. The startup aims to place handy in 1 million hotel rooms in over 100 cities by the end of 2017. Tink Labs is in partnership with major hotels including Sheraton, Novotel, Mercure, Ritz London, Crowne Plaza, and Holiday Inn. The handy phone is customised for each hotel with adjustable UI elements and features. Partners can boost guest engagement and hotel revenues using the handy features including push messaging and onboard reviews system. Whether Tink Labs will become Hong Kong’s first unicorn is still an uncertainty, but it is definitely one startup we need to keep an eye on. If you are someone who decides their next trip days before it happens, this hotel booking app could be a right match for you. HotelQuickly is a last-minute hotel booking app that aims to be the best spontaneous booking tool to help traveller around the globe save some dims. The startup has raised US$5.66 million in Series A from Tokyo’s GREE, Boon Hwee Koh (ex-chairman of Singtel and Singapore Airlines) and William E. Heinecke (CEO of Thailand’s Minor International). The funding was used for product development and expansion in the Asia Pacific region. Launched in March 2013 by five European co-founders, HotelQuickly acquired Japan’s booking app Tonight and expanded its service to over 16 countries. According to an interview in early 2016, HotelQuickly’s booking app has over two million downloads since March 2013. Over 12,000 hotels and resorts partnered with them to sell hotel rooms to last-minute travellers. The HotelQuickly app supports nine languages. Different from the general hotel booking services, HotelQuickly allows users to find best deals and offers the lowest price guarantee. What is worth mentioning is that HotelQuickly allows users to have until 4 AM to book for that night, making it easy for the spontaneous and last-minute travellers. The startup is facing direct competitor like San Francisco-based HotelTonight, who has just raised US$37 million in Series E and eyeing an IPO. HotelTonight is partnering with over 25,000 hotels in 1,700 cities across over 30 countries. HotelQuickly also needs to compete with other renowned online hotel reservation service including Booking.com and Agoda. If you are someone like me who loves to browse through Pinterest and Instagram to admire beautiful scenery from different countries, you will love how Spottly works. Spottly is a picture-first travel guide which allows travellers discover city attractions utilising pictures. The startup offers a crowdsourced series of travel guides created by users around the globe. Users can create a personal travel bucket list using photos and notes, share great attractions and scenery with other users using videos and photos. Founded in 2013 by Edwyn Chan, Spottly has raised US$850,000 in a seed round from 500 Startups, Taiwan’s Cherubic Ventures and Hong Kong’s Mindworks in November 2013. Spottly is available on both Apple App Store and Google Play, the app highlights each city’s best attractions, allowing users to zoom into places of interest for more details. Features over 1 million pictures covering the world’s top 100 travel destination, Spottly app is available in 16 languages. The app has been featured in over 100 countries on the appstore. 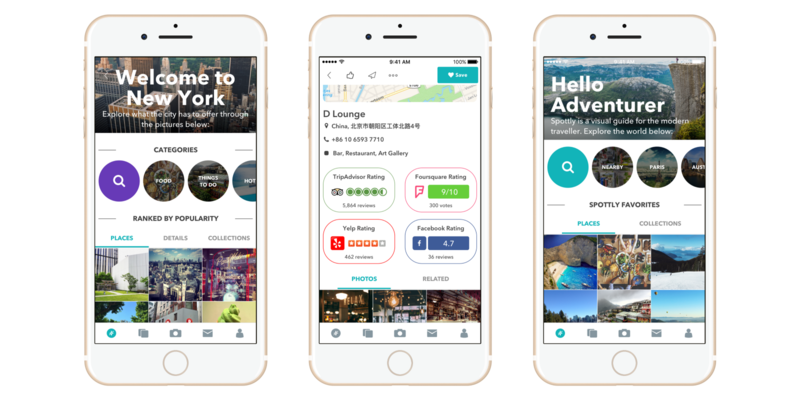 Spottly makes planning a trip easy by showing users photos of great attractions, restaurants and cafes at the destination, complete with addresses and phone numbers by cross-referencing all the data from Instagram, Facebook, Foursquare, TripAdvisor and Yelp. Hi there, we are WHub, your online startup community. We have just launched a whitepaper, Hong Kong Startup Ecosystem Toolbox 2017, showcasing everything you need to know about the Hong Kong startup scene in 2017. If you want to be kept informed of our new posts, you can subscribe to our weekly newsletter or follow our Medium Channel.